There is no better source of care for acne than a good dermatologist. 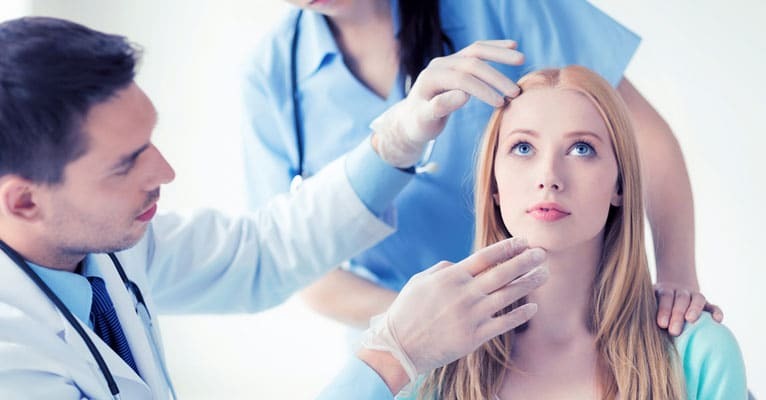 If you don’t have health insurance, however, and often times even if you do, however, your visits to the dermatologist can total hundreds of dollars per month and thousands of dollars per year. Some acne problems should be treated by dermatologists who can provide you with specialized care. Is seeing the dermatologist really necessary? Here are ten situations that call for specialized care. 1. You had clear skin and suddenly you break out in bad acne. Sudden eruptions of pimples, especially if they are not limited to your face, indicate something more than simple infections with acne bacteria. While only a doctor will know for sure, you could be suffering a severe hormone imbalance (use of testosterone sometimes causes sudden and severe acne) or you could be suffering an autoimmune disease. A sign you need to get to the doctor right way is sudden and severe acne with joint pain. Both psoriatic acne and acne fulminans can cause severe joint pain that is followed by permanent joint damage if not treated right away. 2. You manage to clear up your blemishes but they leave dark spots behind. The melanin pigment in your skin does not just give your skin color. It also acts as an antioxidant that stops inflammatory reaction. The darker your skin, the more melanin there is in your skin to stop inflammation. People who darker skin recover from pimples faster than people who have lighter skin. The problem is that the melanin their skins produce to fight inflammation stays in the skin in the form of spots. Any method that fights inflammation with inflammation, such as harsh detergent cleansers, strongly acidic skin peels, lasers at a high setting, or just popping pimples instead of allowing them to heal naturally, can leave spots. You may need to see a doctor to find the kinder and gentler methods your skin needs to heal without forming excessive pigmentation. 3. You have cystic acne. Cystic acne is a pimple covered up by scar tissue. Scar tissue is “healthy” but ugly skin, and there’s no way to get rid of the ugly skin or the cyst beneath it without opening up the skin. If you try this at home by lancing or poking yourself with a pin, you’ll probably fail to get the whole cyst, just allowing it to grow back, but you will almost definitely create an even worse acne scar. Your dermatologist can prescribe medications that cause your skin to grow so rapidly that it opens over cysts naturally and lets them drain without needling, lancing, or minor surgery. 4. You have black or brown skin, and you develop nasty red pimples where you shave your skin. Sometimes people who have darker skin tones develop severe inflammation around ingrown hairs left when the skin is shaved with a dull razor. This inflammation is actually the immune system’s attack on the hair. It’s not caused by acne bacteria. Since mashing or squeezing the ingrown hair just makes the inflammation worse, it is usually necessary to get an anti-inflammatory treatment from a doctor to stop permanent scarring of the skin. 5. You have a “pimple emergency” just before an event at which you need to look your best. A big bulging pimple can be quickly shrunk with an injection of a steroid like cortisone as your acne treatment. If you have less than 48 hours before that big date or photo shoot, steroid injections won’t get the red out but they will leave your skin smoother so you can conceal redness with makeup. But you will have to have an existing relationship with your dermatologist to get this service and you will probably have to pay cash. 6. You have pitted or rolling acne scars. The kinds of skin care products you can get at cosmetics counters actually will do some good for smaller scars if you use them on a consistent basis for several months. But if you have scars that are more than about 3 mm (1/10 of an inch) across, or if you have ice pick (deeply pitted) or boxcar (rolling) scars, your best bet for smoother skin is seeing your dermatologist or aesthetician. They will have many options for giving you smoother skin. 7. You broke out after you started a new prescription medication. The first doctor to contact if you break out after starting a new prescription medication is the doctor who wrote the prescription. But if it’s a medication you simply have to have, then it may be necessary to consult a dermatologist. 8. You want to get rid of both acne and wrinkles. A lot of what dermatologists and plastic surgeons do for wrinkles is to move a wrinkle from an obvious place to a place where it isn’t visible. You might be able to save a tremendous amount of effort with ane easy procedure only a dermatologist or plastic surgeon can perform. 9. You need to come off antibiotics for acne. Sometimes it is a disastrous mistake to stop taking antibiotics for acne cold turkey, all at once. Almost any antibiotic will kill most acne bacteria, but there may be a few bacteria that are knocked down but not out. When you stop taking antibiotics, you may experience rebound acne flares that occur when the meanest and toughest bacteria take over and don’t have either an antibiotic to slow their growth or other, weaker bacteria to compete with them for food. A dermatologist can tell you the dosages you need to come off an antibiotic, or perhaps place you on a different antibiotic for a short time. Your dermatologist can also give you advice on the right strength of benzoyl peroxide (which is not an antibiotic) to get the bacteria your antibiotic misses without causing redness, irritation, and flaking skin. 10. You have especially red and inflamed pimples that seem to be burrowing tunnels to each other and growing together. If you have a rare form of acne known as acne conglobata, you will have pimples that seem to be digging out little tunnels to each other to form super-pimples. That is because you really will have pimples that are digging out little tunnels to each other to form super-pimples. Usually occurring on the back and trunk as well as the face, acne conglobata is not something you should try to treat on your own.